COLUMBUS, Ohio – The No. 14 Ohio State University men’s volleyball team returned to the win column Saturday night (Feb. 2), handing Lincoln Memorial University (5-3) a four-set defeat. Three of four frames ended with a 25-23 ledger, two going in favor of the Buckeyes. Ohio State added a 25-19 second stanza to improve to 4-5 on the season (25-23, 25-19, 23-25, 25-23). The trifecta of ‘25-23’ sets included a total of 30 tied scores and 14 lead changes, separating the two squads by inches. SET 2: Ohio State maintained possession of momentum in the second, rolling along offensively to a .484 rhythm (19-4-31) and nearly doubling the Railsplitters’ digs effort (9 to 5). 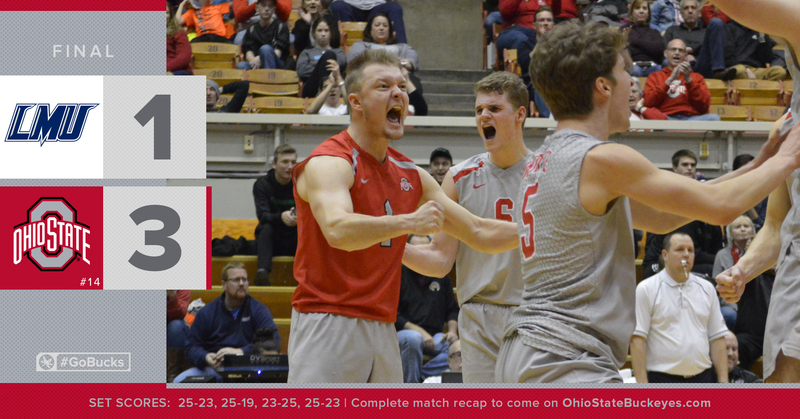 Leeson bounced five kills and the Buckeyes entered intermission with a 2-0 edge in-hand thanks to a 25-19 triumph.